You know that protein is important for every part of the body including your bones. So let’s discuss the hard facts about your bones and their relation to protein. “Protein” originates from the Greek word for “first.” And it’s the first thing we typically design our meals around. You’ve probably heard that proteins are the body’s “building blocks.” They build the foundation of every living thing. Under a microscope, they are long chains of amino acids linked together into complex Lego-toy shapes. There are 20 amino acids needed for metabolism and human growth. Twelve of these are classified as nonessential. That means your body can produce them, so they you don’t need to consume through diet. Your body can’t produce the 8 remaining amino acids though, and these are classified as essential. Essential meaning you have to get them through your diet! These Lego pieces build bone, muscle, hair, blood, tissue, immune system antibodies, and enzymes vital for life. Without them, it would compromise the ability of your tissues to grow, be maintained and be repaired. Furthermore, protein makes up roughly one-third of your bone’s “mass” (the amount it contains) and half of its “volume” (amount of space it takes up). The bone’s protein is continuously being remodeled – repeatedly broken down and built back up. Therefore, you need daily building supplies to maintain bone. This is because, unfortunately, the protein that is broken down isn’t reabsorbed and then reused! You know that many factors influence your bone health. Calcium is one of them. But calcium and protein closely interact. So you need to get enough of both calcium and protein to fully realize the benefits of each nutrient on bone. Why is #4 included in the list? Remember that bone health is not just a skeletal issue. It is a musculoskeletal issue. Loss of bone is closely related to loss of muscle that occurs with age. One of the most important differences between “old” and “young” is strength. You can be lean and frail or heavy and frail, but you can’t be strong and frail! It’s been said that protein intake increases urinary calcium loss. But whether negative calcium balance results will depend on dietary calcium intake. For each nutrient to fully benefit bone, BOTH calcium and protein intake must be sufficient. Please don’t miss this. The best thing you can do for your bones is to take adequate calcium and protein. Research shows that when you get adequate calcium in your diet, having higher protein intake benefits bones. And the effect of protein on bone mass may actually depend on calcium intake. In several studies, high protein in the diet did make the body lose more calcium in urine. But an actual reduction in calcium in bones depended on how much calcium the person consumed. Researchers found bone mass density had a favorable impact in those people who had a high protein intake and supplemented with calcium and vitamin D supplements. One study, in particular, was conducted with 342 healthy men and women, over the ages of 65. Over the 3-year trial, half of the participants supplemented with calcium and vitamin D and half with a placebo pill. Associations between protein intake and changes in bone mass density were examined every six months by a DEXA scan. At the end of the trial, the researchers identified a positive association between dietary protein intake and change in bone mass density in those with the highest intake of protein, who supplemented with calcium and vitamin D.
Essentially, if a high-protein diet has a negative effect on your bones, it is only because of low calcium intake. Now, this study and those like it identify that bone mineral density may be improved by increasing protein intake in many older men and women as long as they meet current recommended intakes of calcium and vitamin D. However, these improvements are in comparison to the placebo group, who are still losing bone density. If you’re looking to outright increase your bone density, you need to supplement with a proven, bone-building supplement in addition to adequate protein intake. Does Protein Leach Calcium From Your Bones? Is it true that eating too much animal protein takes calcium from bones? It is true that an increase in dietary protein results in greater urinary calcium. But, it has been unclear what the source has been for this urinary calcium. A high intake of protein, particularly from animal sources, generates a high fixed metabolic acid load. This is due to animal proteins containing higher amounts of sulfur-containing amino acids. If your kidneys and lungs were unable to handle this increased acid load from your diet, a buffer would be necessary through osteoclast-activated bone resorption (bone breakdown). Your bones would provide this buffer and be the reservoir from which calcium would be released from the bone. This hypothesis is supported by both animal and cellular studies. However, is this acid production from a high-protein diet enough to adversely impact bone? Especially in healthy individuals, the lungs work to regulate the pH by immediately releasing carbon dioxide (which is a metabolic by-product). The kidneys also excrete excess hydrogen ions, primarily as ammonium ions and secondarily as phosphonates. A 2004 study of elderly men and women found that those given higher dose protein supplements did not lose any more calcium. But the high protein group had significantly higher levels of IGF-I, a bone growth factor, and lower urinary N-telopeptide, a marker that signals bones are being broken down. Several studies show a link between protein and increased bone density and decreased fractures. For example, a Hawaiian study of premenopausal women found that high protein increased bone mineral density. However, this study also showed that problems occurred when too little protein was eaten. This resulted in less calcium being absorbed from food. And worse, parathyroid hormone increased, which caused calcium to be released from bones. Also, as they aged, there was a decline in IGF-1 (insulin-like growth factor hormone), which as mentioned earlier, is needed for dense bones and muscle growth. Therefore, maybe the conversation should be about how too little protein increases risks. This is especially prevalent in the elderly and in constant dieters who often don’t eat enough protein. 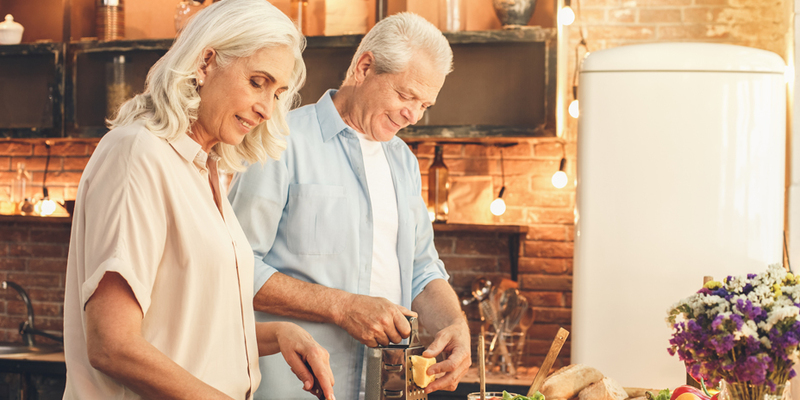 Another recent study followed postmenopausal men and women aged 50 and over for up to 32 years and found no evidence that a higher protein intake increases the risk of hip fracture. This analysis followed 74,443 women in the Nurses’ Health Study between and 35,439 men from the Professionals Follow-up Study. Total protein intake and animal proteins were not significantly associated with hip fractures in women. And both plant and dairy protein were associated with significantly lower risks of hip fractures when results for both men and women were combined. You’ll find that most official health organizations or websites recommend a modest protein intake. You see, the original RDA for protein was made with preventing a deficiency in mind. Not for promoting optimal health. And the recommendations were based on studies conducted in young, healthy adults. It fails to take into account the physiological changes that occur with aging. Sarcopenia – This is the process where, as you get older, you start to lose muscle mass every year. The exact amount of muscle loss varies from person to person, but recent research suggests that the average rate of muscle loss for people over 70 is 0.5-1% per year. Reduced Ability to Make Muscle – You start to develop an anabolic resistance to amino acids as you age too. In simple terms, that means you become less efficient at turning the protein you consume into muscle. So with that in mind, recent research suggests that older adults actually consume 1-1.5 g of protein per kg of body weight. This amount translates to 20-30 grams of protein at each of your three meals during a day. But there’s an important thing to note. To maximize your body’s ability to use this extra protein to produce muscle, it’s best to separate your meals by 3-5 hours. But again, these are just updated guidelines. For the most accurate calculation of your own, individual protein needs, you need to take your age, height, body weight, and activity level into consideration. The visual below makes it easy for you! Several studies also point to a positive effect of high protein intake on bone mineral density or content – as the current RDA for protein may be too low to prevent fractures. For protein requirements in greater detail, read the following on general principles for estimating protein requirements. You can also use this easy online protein calculator. What classifies foods to be the best source of protein? You can take into consideration the amount of protein per gram, how it’s raised (grass fed vs. grain fed, organic vs. conventional) and then whether or not it’s a complete or incomplete protein. The quality of a protein source depends on the amount and types of amino acids it contains. And the foods, or food combinations, that you eat in a day need to contain all of the essential amino acids the body uses. Neither plant nor animal protein is better for bones; they’re just different. And they offer a different set of nutrients — so you should get both. Research doesn’t support the popular theory that animal protein-based diets may increase the amount of calcium lost in urine. In the Framingham Osteoporosis Study of over 600 people averaging 75 years old, for example, a higher intake of animal protein was not associated with a decrease in bone mineral density. Other studies came to the same conclusion. In addition, several studies don’t support the idea that vegetable-based proteins are better for bone health than animals ones. Leading scientific journals The American Journal of Clinical Nutrition and The Journal of Nutrition both discuss this theory. On the contrary, some studies have found that meat is associated with higher amounts of the hormone IGF-1, which in turn might increase bone mineralization and reduce fractures. Also, meat contains significant amounts of the mineral phosphorus. And phosphorus seems to reduce the effect that protein has on calcium excretion. Protein is available in a variety of dietary sources. The options are endless! That includes both animal and plant origins. Typically, all dietary animal protein sources are considered complete proteins. Complete meaning it contains all of the essential amino acids we talked about at the beginning of this post. Proteins from vegetable sources are typically incomplete and lack one or two of the essential amino acids, however, there are a few that are complete. So if you are someone (vegetarian or vegan) who chooses plant proteins, it’s important to get a variety of fruits, vegetables, grains and legumes to ensure you get all of the essential amino acids needed. **Incomplete does not mean they’re inferior. You can create complementary proteins to provide the right balance of essential amino acids. You can also check out our Vegetarian’s Guide to Protein and Collagen for a more in-depth look into protein for vegetarians. Want a printable PDF of 10 Great Sources of Protein for Healthy Bones? Click here. There is a reason why protein gets the starring role in most of our meals. Here are some of the top protein benefits. Eating protein reduces your appetite (calories in) while also boosting your metabolic rate (calories out). If you’ve ever thought about increasing muscle mass, you’ve thought about upping your protein intake. Studies show that a higher protein intake helps build muscle and strength. For how much protein you need, depending on your age and physical level, check out our “How Much Protein Do You Need?” section. A study published in The American Journal of Clinical Nutrition found that women who increased protein intake to 30% (from 15%) of their total calories, ended up eating 441 fewer calories per day. The result? They lost an average of 11 pounds in just 12 weeks! Studies have consistently demonstrated the benefits of protein supplementation post-exercise for recovery. Protein has been found to reduce muscle soreness and damage, plus improves muscle function following exercise. How does protein do this? During exercise, your muscle fibers are damaged and a series of actions must happen to repair them. Using dietary amino acids, the cells of your muscle can grow together and create new muscle fibers. Or, in the case of weight lifting or muscle building, the cells can attach to damaged muscle fibers, which increases the muscle protein and can build the size of the fiber. The result is a renewed muscle protein and brand-new muscle cells. However, you need high-quality protein from your diet to give your muscles the amino acids required for this process. Dietary protein works synergistically with calcium to improve bone metabolism. Many epidemiological studies have found a positive relationship between protein intake and bone density. It positive impacts several mechanisms: calcium absorption, the secretion of insulin-like growth factor-1 and enhances lean body mass. Protein directly affects your brain performance because it provides the amino acids that make up your neurotransmitters. These are the brain cells that transmit signals to different parts of the body so you can carry out tasks. Furthermore, when we don’t get enough protein, your brain can’t produce enough serotonin, which is your ‘feel good’ hormone. Eating protein has been shown to reduce cravings and late night snacking. A study published in the Nutrition Journal had participants either skip breakfast, eat a normal breakfast (15% of calories from protein) or a high-protein breakfast (40% of calories from protein) for 7 days in a row. On the seventh day, dopamine levels and food cravings were looked at. Those who ate breakfast had a decline in sweet cravings, while the breakfast-skippers saw an increase in cravings. However, those who followed the high-protein breakfasts saw an increase in dopamine. What does dopamine have to do with it? It’s the chemical in your brain that regulates food as motivation or a reward. So these high-protein breakfast eaters associated their breakfast as a reward, which resulted in fewer cravings during the day. Collagen makes up 30 percent of the total body of protein and is well known for its skin benefits. A sign of protein deficiency is delayed nail growth. If you’re worried about blood sugar levels with higher protein intakes, don’t be. Protein has minimal effect on blood glucose levels with adequate insulin. The reason why protein doesn’t increase blood glucose levels is unclear, but some possibilities may be a slow conversion of protein to glucose or less protein being converted to glucose and released as previously suggested. It’s a common misconception that a high-protein diet harms your kidneys. If you have pre-existing kidney diseases, it’s true that restricting your protein intake may be beneficial. However, if you don’t suffer from pre-existing kidney issues, a high protein is not hazardous for healthy kidneys. Epidemiological studies show that an increased intake of protein has been associated with lower blood pressure and may reduce the risk of cardiovascular disease. Sarcopenia refers to the strength and skeletal muscle loss associated with aging. Increased protein intake above the RDA of, 0.8 grams of protein per kilogram of body weight, is suggested to reduce muscle mass with age. If you’re 65 years or older and suffer from sarcopenia you may need more like 1.2 to 1.5 grams of protein per kilogram per day. 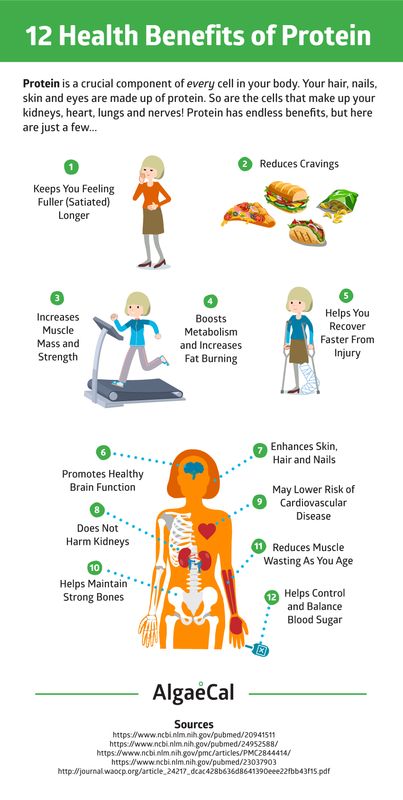 In addition, omega 3s play a role in muscle mass, too. Discover how omega 3s also protect us from developing sarcopenia. Don’t shy away from protein. Protein is a crucial component of every cell in your body! You not only need it to repair and build tissues, but it’s an important building block for cartilage, blood, skin, and bones. No matter your diet or lifestyle there are plenty of protein options for you. But also remember to think about what you don’t want from protein. Pesticides, herbicides, chemical fertilizer, hormones, antibiotics, nitrates/nitrites, preservatives, and pollutants/carcinogens will not benefit you or your bones. So make sure you choose high quality, organic, grass-fed and wild sources whenever possible. Have any recipes or tips to add more protein to your diet? Share them with us in the comments below! This article was incredibly useful. Thank you! I have recently been diagnosed with Osteoporosis. I started weight training with a trainer, stopped drinking sodas, limiting sugar and salt in my diet and I’m taking a calcium supplement with Vitamin D every day. My goal is to stay off the Osteoporosis medicine which my doctor recommends. How long should I wait before I have another Dexa scan? We love that you’re taking a natural approach to strengthening your bones, Trisha! Based on our human clinical studies, measurable results on a DXA scan can be seen in as little as 6 months time when taking our Bone Builder Pack (AlgaeCal Plus & Strontium Boost). That said, AlgaeCal is unique in that it’s the only calcium supplement with clinical trials showing it can increase bone mineral density – all other calciums have only been able to slow down bone loss. For this reason, we aren’t able to provide a time frame on when you might see results with other products. If you have any questions we encourage you to give our Bone Health Consultants a call at 1-800-820-0184! Thanks so much for these in depth longer articles,. I enjoy reading all the excellent info, One question i have is about calculating protein needs. Is this based on ideal weight or present weight,. I have read both opinions,. Thanks. Happy to hear you’re enjoying our articles! Thank you so much for your emails that are much appreciated. I think this is a subject that everyone can benefit from reading. As I know so many people who suffer from Osteopenia or Osteoporosis. Thank you for all the info, it is very beneficial. Thanks for the kind words, Elvira! We’re so glad you enjoy the information we share 🙂 If you ever have questions please don’t hesitate to let us know! Your message is very informative. What can you say about the food supplement that contains high amino acids in combinations in a tablet form can this replace the food we eat on daily basis? My daily breakfast is one hard boiled egg a slice of grass feed butter(Kerrygold) spread over 2 slices of toasted white bread; half a teaspoon of dark chocolate(cacao)powder; 1/2 tsp. virgin coconut oil cold expressed; 2 tbsp. of garlic extract & tea-bag of Japanese green tea in a beer-mug size cup of hot water. (the garlic juice comes from 3 bulbs of garlic(skin-out) into a blender set at liquid with a beer-mug size of water and set it up at room tempt.. until it turns greenish-blue(the color is due to sulphur) and take 2 tbsp. of this extract that passes thru a sieve. Keep refrigerated & sake it on use for the extract settles at the bottom of the jar. Thank you again for sharing such good food info. So great to hear you find our content informative! While amino acids can be beneficial when incorporated into your daily regimen, there is no replacement for a healthy and varied diet. So glad this post was valuable for you! Including the weekly newsletters. Excellent post. Very comprehensive and helpful information. Thanks, Sheryl. Wonderful to hear and truly appreciate the feedback! Always informative and interesting reading. Thank you for sharing your research. Sorry to see you go! But no problem at all, we will take you off our newsletter list. I like to read more. Thank you very much!